15 a-ha perform "Nothing Is Keeping You Here" at the "Bayerischer Filmpreis" (Bavarian movie awards), Prinzregententheater in Munich (broadcast on TV channel BR, Bayerischer Rundfunk, 20:15). 16 Magne's "Alpha Beta" exhibition opens at Edinburgh Printmakers. It runs until March. 24 Morten performs the Christian hymn "O Bli Hos Meg" (Norwegian version of the English hymn "Abide With Me") at the Oslo Opera House as part of the charity concert "Dugnad For Haiti". 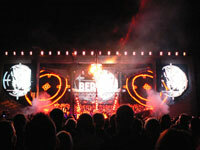 At the end of the concert, Ole Paus and other artists, including Morten, perform "Den Stilleste Timen". 01 Apparatjik play live at the WMF Club in Berlin as part of "Club Transmediale" festival. 15 A collection of live songs from the Halti fundraising concert on 24 January is released in Norway. Morten's live performance is not included on the CD, but the studio and live versions of "Den Stilleste Timen" featuring Morten on vocals are included. 17 Magne F is in discussion with Paul Stolper about his Alpha Beta works at Edinburgh Printmakers (16:30-17:30) followed by a reception with Magne (18:00-20:00). 18 Magne returns to Oslo for the annual by:Larm music festival / conference and attends a concert by Danish band Oh No Ono. 20 Magne is jury leader for Statoil talent grant. He appears at Folk restaurant in Oslo for the by:Larm festival conference to reveal the winner of the grant, Ingrid Olava. 01 Morten and Magne hold a press conference in Oslo to announce the Norwegian tours dates and to reveal news that they will hand out a new talent grant (4 million kroner) to local bands, one in each of the towns Oslo, Bergen, Trondheim and Kristiansand. Paul is in New York so isn't present at the press conference. 03 a-ha.com is relaunched with a new look. 05 - 28 Some of Magne's canvas prints are exhibited at Gallery Benoit, Boston, USA. 09 Tent outside Alameda Quality Center, Bauru, Brazil The set includes the additional song "Touchy!". Fan, Viviane, is brought up on stage during "Take On Me". a-ha do a brief interview for "TV TEM". 10 Credicard Hall, Sao Paulo, Brazil The set list of 22 songs includes a new acoustic version of "Minor Earth Major Sky" and "The Swing Of Things" in place of "Touchy! ", "And You Tell Me" and "Living A Boy's Adventure Tale". The show is sold out. 13 Citibank Hall, Rio de Janeiro, Brazil. 23 songs are played, including "You Are The One". 14 Chevrolet Hall, Belo Horizonte, Brazil. 22 songs are played, "You Are The One" is dropped. 16 Ginásio Nilson Nelson, Brasilia, Brazil. Morten has a throat infection and the set list is cut to 20 songs. 18 Chevrolet Hall, Recife, Brazil. Due to Morten's throat infection, the set list is down to 18 songs with "Summer Moved On" and "The Swing Of Things" cut. 20 Siara Hall, Fortaleza, Brazil. The set remains at 18 songs. 23 Movistar Arena, Santiago, Chile. Morten's voice is improving and the set list is back to 20 songs. 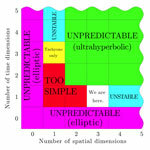 "Minor Earth Major Sky" is included, but there is no "The Swing Of Things". 26 The Norwegian children's film "Yohan" opens in Norway. Morten plays the husband of Lexya and father of Levi. Morten's scenes were shot in the summer of 2008. 24-21 May An exhibition of 30 Alpha Beta graphic prints by Magne F are exhibited at Galleri Elsa in Namsos, Norway. 28-2 May Magne exhibits some of his Alpha Beta work as part of the annual Soddjazz festival at Inderøy, Norway. 29 New commissioned work "Umsteiger" is unveiled at Friedrichstrasse 149, Berlin, Germany. The work consists of 100 square metres of translucent foil on architectural glass with a motif of English anagrams based on the German word "Umsteiger" ("in transit"). 04 "The Singles 1984|2004" is released in the U.S.
06 Nokia Theatre, New York, USA. Support act: Sondre Lerche. 07 Nokia Theatre, New York, USA. Support act: Sondre Lerche. 08 Nokia Theatre, New York, USA. Support act: Sondre Lerche. 01 Sparkassen Arena, Kiel, Germany Early Morning is dropped from the setlist. 05 Apparatjik have their second ever concert / art performance as part of Hugo Opdal's "Go with the Flø" art festival. Apparatjik launch their limited edition CD, DVD, 12" and one of eight prints boxset "Bolshevik Box" in Flø. 06 Hessentag, Stadtallendorf, Germany - RESCHEDULED. Early Morning is back in the setlist. 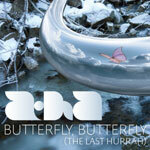 14 Worldwide premiere on Norwegian radio of a-ha's last ever single "Butterfly, Butterfly (The Last Hurrah)", written by Paul Waaktaar-Savoy and produced by Martin Terefe. Magne is interviewed on NRK P3's "P3 Morgen" and Morten is interviewed on NRK P1's "Reiseradioen". Apparatjik release their album "We Are Here". 18 Magne appears at the Rådhusplassen in Oslo to award the first 1 million kroner a-ha talent grant to the jazz/metal band "Shining". 05 "Butterfly, Butterfly (The Last Hurrah)" is sold as a digital single in Norway. Remastered 2-disc deluxe editions of "Hunting High And Low" and "Scoundrel Days" are released in the UK. They feature the remastered original albums plus bonus tracks of mixes, demo versions and early versions, some of which are previously unreleased. Four additional bonus tracks for each album are available for download only. The video for "Butterfly, Butterfly (The Last Hurrah)" is filmed in England and directed by Steve Barron. 14 Papp László Sportarena, Budapest, Hungary. The set opened with "Butterfly, Butterfly (The Last Hurrah)". 15 "Butterfly, Butterfly (The Last Hurrah)" premieres on the Ken Bruce show on UK Radio 2. During their time in Germany, Paul and Morten do promotion in Hamburg and Munich including an interview with Sound Base Online magazine (interview with Paul, Munich, 20 July), Badische Zeitung (Paul and Morten) and a short radio interview on WDR2. 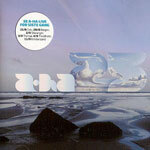 19 a-ha release their best of compilation "25" in Norway. 21 "Butterfly, Butterfly (The Last Hurrah)" is available as a digital download in Japan. An interview with Magne is published in Dagbladet's weekend magazine. 25 Elbufer, Dresden, Germany. 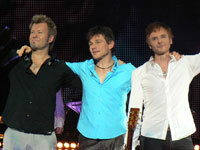 a-ha included an acoustic version of "(Seemingly) Nonstop July" in the set, to replace "Early Morning". 30 "Butterfly Butterfly (The Last Hurrah)" is released to German music stores. It is also available as a digital download in Austria, Czech Republic, Hungary, Poland and Slovakia. "Butterfly Butterfly (The Last Hurrah)" is available as a digital download in Australia Belgium. Brazil, Canada, Eastern Europe, Finland, France, Greece, Ireland, Italy, Luxembourg, The Netherlands, Portugal and Sweden. The deluxe editions of "Hunting High And Low" and "Scoundrel Days" are released in Australia, Belgium, Canada, Denmark, Finland, France, Greece, Ireland, Italy, Luxembourg, Mexico, Netherlands, New Zealand, Norway, Portugal, Spain, Sweden, USA. 06 a-ha's best of compilation "25" and also the deluxe editions of "Hunting High And Low" and "Scoundrel Days" are released in Germany. "25" is also released in Austria, Czech Republic, Hungary, Poland and Slovakia. 07 Summer Sonic Festival, Tokyo, Japan. Set list: The Bandstand / Foot Of The Mountain / Move To Memphis / The Blood That Moves The Body / Stay On These Roads / Scoundrel Days / I've Been Losing You / Cry Wolf / Hunting High And Low / The Sun Always Shines On TV / The Living Daylights / Take On Me. 08 Summer Sonic Festival, Osaka, Japan. Same set list as previous night. 21 The book "The Swing Of Things 1985-2010", an update of the 2004 edition, is released in Norway. Ullevaal Stadium, Oslo, Norway (TSASOTV / MTM/ TBTMTB / SD / SOTR / MS / HH&L / TB / WLFTW / BBTLH / SNJ / CITR / MEMS / FNY / SMO / IBLY / FOTM / CW / Analogue / TLD / TOM). 28 Brann Stadium, Bergen, Norway. An audience of 25,000, the same set list as Oslo. 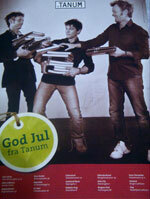 31 Magne and Morten are in Trondheim to promote Saturday's concert. 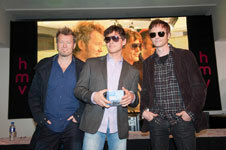 They visit Rockheim, the new interactive centre for Norwegian pop and rock, it includes an a-ha exhibit. "25" is released in Japan and Spain. 02 Rått og Råde Festival, Stavanger, Norway. An audience of 10,000 and 18 songs in the set list, excluding the acoustic part of the set. 03 Døgnvill Festival, Tromsø, Norway. An audience of 13,000, Anneli Drecker joins a-ha on stage for a duet on "Crying In The Rain". 04 Lerkendal Stadium, Trondheim, Norway. An audience of 15,000 and the full 21-song setlist. 20 "Butterfly Butterfly (The Last Hurrah)" is released to music stores in the UK. 23 Apparatjik play a concert at the Serpentine Pavillion in Hyde Park, London, UK. 04 "25" is released in Australia, Belgium, Brazil, Canada, Eastern Europe, Finland, France, Greece, Ireland, Italy, Luxembourg, Netherlands, Portugal, Sweden and the UK. Oslo Konserthus, Norway. The show is to benefit Mercy Ships and only limited tickets are available. 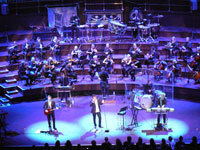 a-ha perform the albums "Hunting High And Low" and "Scoundrel Days" in their entirety with an ensemble from Oslo Philharmonic Orchestra at this show. 06 Signing session, 6pm at HMV, Oxford Street, London to promote the release of "25". 350 wristbands for the signing are available from 9am. Following the signing session is a special live show at Heaven, London, the first 25 people in the queue for HMV wristbands receive a pair of tickets, as did 250 people who order "25" online through HMV. 08 Royal Albert Hall, London, UK. 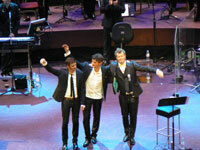 At this show, a-ha perform the albums "Hunting High And Low" and "Scoundrel Days" in their entirety with an ensemble from Oslo Philharmonic Orchestra. The whole of the "Hunting High And Low" performance plus three songs from "Scoundrel Days" are broadcast on Radio 2 in the UK on 21 October. Morten and Magne are interviewed on the UK TV show "Loose Women" and the band perform "Take On Me" (live). 10 Heineken Music Hall, Amsterdam, Holland. Jimmy Gnecco is support act for this show and for the next 5 shows. 20-30 Dec To coincide with the opening of the exhibition "Hunting High and Low: 25 years with a-ha", an international conference entitled "Living A Boy's Adventure Tale: musical transgression in the decades of postmodernism" is open at the National Library of Norway in Oslo. It highlights the different periods in a-ha's career. 29 O2 World Arena, Berlin, Germany Morten appears on the Farmers' market scene on "The Armstrong and Miller Show" (series 3, episode 1). He is setting up a stall selling mustard. 31 MTV, UK air a special "a-ha's Greatest 80's Videos" with the band introducing 40 music videos from the 80's. 02 Siemens Arena, Vilnius, Lithuania Morten's mother, Henny, passes away at the age of 80. 5 An interview with Morten is published in This Is Nottingham. 12 Interviews with Morten are published in The Star and Chronicle Live. 14 An interview with a-ha is published in the Express. 15 Brighton Centre, Brighton, UK. The support artist for the UK leg of the tour is Jimmy Gnecco. 18 An interview with Magne is published in Wales Online. 21 Trent FM Arena, Nottingham, UK. An interview with Paul and Magne is published in Bournemouth Echo. 22 a-ha do their final appearance on UK TV, they are interviewed on the "Alan Titschmarsh Show" (ITV1) and perform "The Sun Always Shines On T.V." (live). An interview with Paul is published by Manchester Confidential. 01 a-ha do a signing session for the new edition of their book "The Swing Of Things" at Tanum bookstore in Oslo. 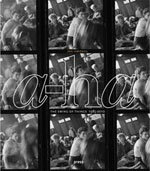 The book publisher, Press, hosts a discussion about a-ha at the House of Literature in Oslo. Jan Omdahl, author of "The Swing Of Things" and music journalist Audun Vinger take part. 02 Spektrum, Oslo, Norway. The set list for these final shows in Oslo was the same as the UK / Germany shows. 03 Spektrum, Oslo, Norway. For the final two shows, fireworks and streamers are released from stage. 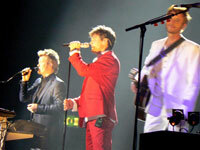 Also, a-ha come on stage for the final song wearing red (Morten), white (Paul) and blue (Magne) suits. An official fan party takes place after this show, Lauren Savoy attends, but the band members do not. 04 Spektrum, Oslo, Norway (final ever show). As a tribute to their first manager, Terry Slater, a-ha add an acoustic version of the Everly Brothers' song "Bowling Green" to the set (the penultimate song). [The Sun Always Shines On T.V. / Move To Memphis / The Blood That Moves The Body / Scoundrel Days / The Swing Of Things / Forever Not Yours / Stay On These Roads / Manhattan Skyline / Hunting High And Low / The Bandstand / We're Looking for the Whales / Butterfly, Butterfly (The Last Hurrah) / Crying In The Rain / Minor Earth Major Sky / Summer Moved On / I've Been Losing You / Foot Of The Mountain // Cry Wolf / Analogue / The Living Daylights // Bowling Green / Take On Me] This show is recorded for future DVD release, directed by Matt Askem, multitrack recording by Huub Lelieveld and 5.1 sound mix by Toby Alington. 15 Magne and Heidi attend the premiere of Marius Holst's new movie "Kongen av Bastøy" at the Colosseum cinema in Oslo. 28 The German Kabel Eins TV show "Number One" features a 45 minute documentary about a-ha, hosted by Markus Kavka. The show includes interviews with all three band members (from late 2009), Bunty Bailey, producer Andreas Herbig and a-ha manager Harald Wiik. 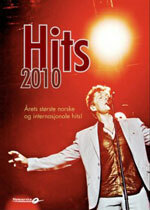 Norsk Noteservice publish "Hits 2010" which includes lyrics, tabs and chords for guitar and keyboard of various Norwegian and international hits from 2010. a-ha' "Butterfly, Butterfly (The Last Hurrah)" is amongst the 36 songs. The charity single for Haiti "Den Stilleste Timen" featuring Morten on vocals is also included. A live shot of Morten is printed on the front cover of the book. Magne signs a three year contract with Galleri Trafo in Asker to rent part of the second floor of the gallery for future exhibitions.